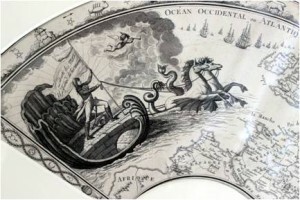 Napoleon conquering the sea, French fan leaf, ca. 1800. 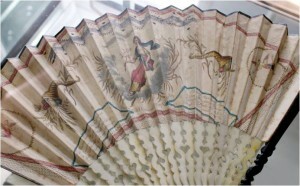 A fan was a popular accessory in the Romantic Age. 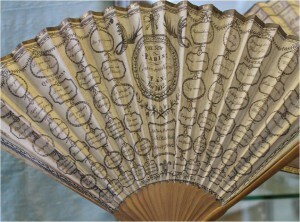 No lady would be seen without a fan at a ball or assembly. 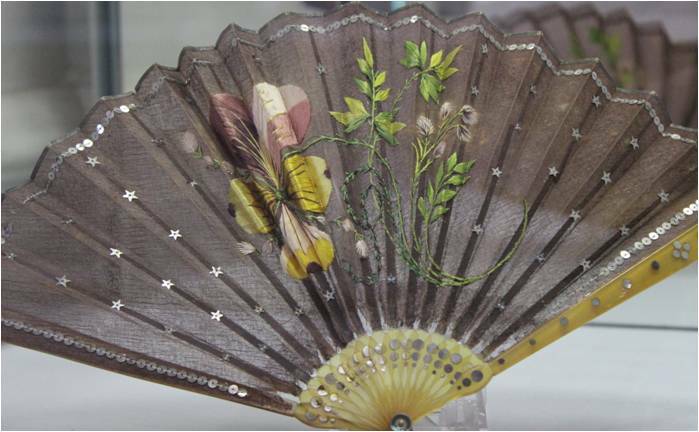 The design of the fans was as varied as was the fashion. Often political events were celebrated or commemorated with special designs for fans. The victories of the British Army during the Peninsular Wars and the Battle of Waterloo were such occasions. It is even possible to tell a brief history of the Napoleonic Wars in 10 beautiful fans made between 1800 – 1816. Napoleon setting out to conquer the world. The French Revolutionary Wars were fought between the French First Republic and several European monarchies. In 1793, France declared war on Britain. Britain fought France in the Flanders Campaign from 1793 to 1795. 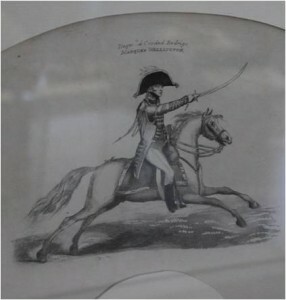 Young Arthur Wellesley, the later Duke of Wellington, joined the campaign in 1794. He served as Lieutenant-Colonel at the Battle of Boxtel. The French fan leaf (photo on the right) from around 1800 shows Napoleon and his troops looking across the sea to a city seemingly worth conquering. The coast may well be the English coast. The Treaty of Amiens ended hostilities between France and Britain in 1802. But peace lasted only one year. During the Peace of Amiens, when travelling to Paris was possible again, this New Paris Conversation fan (photo on left) was made in England. 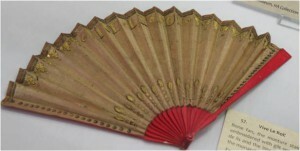 On the left side of the leaf, questions are written in English and French, answers are written on the right side. The answers and questions are believed to be an amusing game. Plenty of fans commemorate Horatio Nelson and his victory and death at Trafalgar. In 1805, the Royal Navy led by Nelson and his ship “Victory” defeated a French and Spanish fleet, confirming Britain as “Ruler of the Waves”. Nelson was hit by a musket ball during the battle and died shortly after. 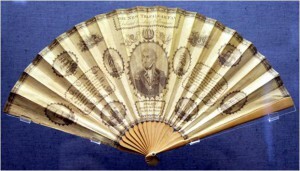 The fan (photo on the right) features Nelson’s famous flag signal “England expects that every man will do his duty“. French troops invaded Portugal from Spain in 1807. British troops fought the French from 1808. The fortress at Ciudad Rodrigo had served as a French garrison. 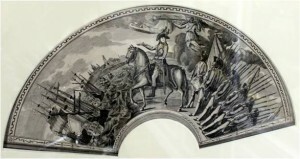 Its fall under an assault of Wellington’s troops in 1812 opened the northern gateway into Spain for the British Troop. More than 900 soldiers were killed in the battle, and the winning British troops ransacked the city befor their officers could stop them. 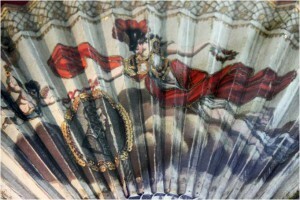 The photo on the right shows a fan leave made to celebrate the storming of Ciudad Rodrigo in 1812. In honour of the victory, the title 1st Duke of Ciudad Rodrigo was conferred to Arthur Wellesley. Here you see Wellington being crowned as victor of one of the battles of the Peninsular Wars. 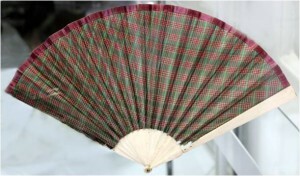 The Portuguese fan was made ca. 1813, is silvered, gilded and embroidered with a gold thread. The Peninsular War ended with The Peace of Paris in May 1814. Napoleon abdicated in 1814 and was exiled to the isle of Elba. This fan (right side) commemorates the return of the French monarchy. It is made of silk and embroidered with gilt sequins and spangles. On the border, you can read the words Vive le roi. 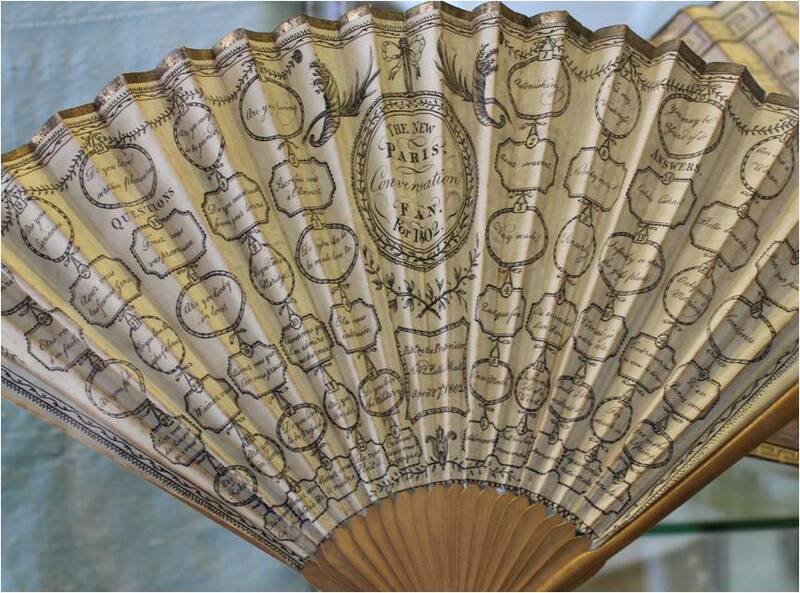 Bonapartists were showing their loyalty to the Emperor by carrying a so called pansy fan after his abdication in 1814. 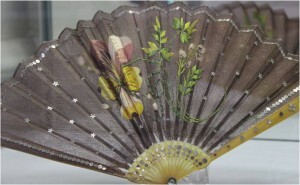 The pansy was a symbol for Napoleon and his return to power. In the spring of 1815, Napoleon escaped from Elba and returned to power in France. On 18 June 1815, allied troops under the command of Wellington defeated his army at Waterloo. This fan from 1815 was inspired by the Highland regiments such as the 92nd fighting at Quatre Bras and Waterloo. The 92nd later marched to Paris. On their way, their kilts impressed both Belgian and French ladies and tartan became fashionable.